BIG ANNOUNCEMENT! and more details coming your way! 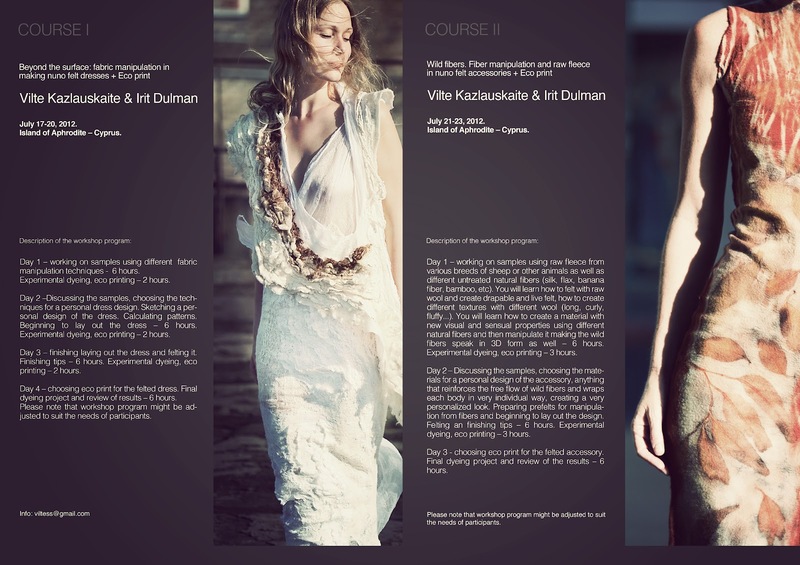 But...if you are interested in exploring nuno felt textures and natural eco print with me and Irit Dulman in the island of Aphrodite - Cyprus (can you believe it??? :) reserve the dates this July! Beyond the surface. Fabric manipulation in nuno felt dresses + Eco print. Wild fibers. Fiber manipulation and raw fleeces in nuno felt accessories + Eco print. Beyond the surface - focuses on creating textures using fabric manipulation. We will also go deep into how to construct a garment, different wool lay out techniques, shrinkage, constructing of the pattern. Irit will teach eco printing and dyeing, and she will focus more on dyeing fabrics and nuno felt. Second workshop - Wild fibers - focuses on creating textures using raw fleeces + fiber manipulation, which is different than fabric manipulation in the first course. We will create our own fabric from raw fibers and will learn how to give it dimension and combine with all texture from fleece. I will show how to make very light felt with fleeces, but will also cover how to make it thick if preferred. We will not go deep into pattern making and construction in this workshop, it's just for an accessory but completely different materials and techniques than the first one. Irit will also teach eco print and dyeing, but here she will also focus on dyeing raw fleece and fibers (fabrics and felt as well). I am fan your imagine Beautiful!